Singers needed for Memorial Mass Choir - Rehearsals begin Thursday, September 6th 6:45 to 7:45PM in the Carolan Room. Memorial Mass is November 4th. So why not plan to join us as we prepare a unique program of song from the Irish in America. It's a great way to celebrate our Irish Heritage. The rejuvenated Glee Club has performed for our Memorial Mass, presented a Christmas Program, and "We Will Remember," a program commemorating the 1916 Easter Rising. Although the numbers may be smaller than the original group, the spirit and love for singing vibrantly permeates the Glee Club's reincarnation. New members are always warmly welcomed. Current Glee Club members stand by their 1995 Glee Club photos. The original photo is on display in the GAC board room. 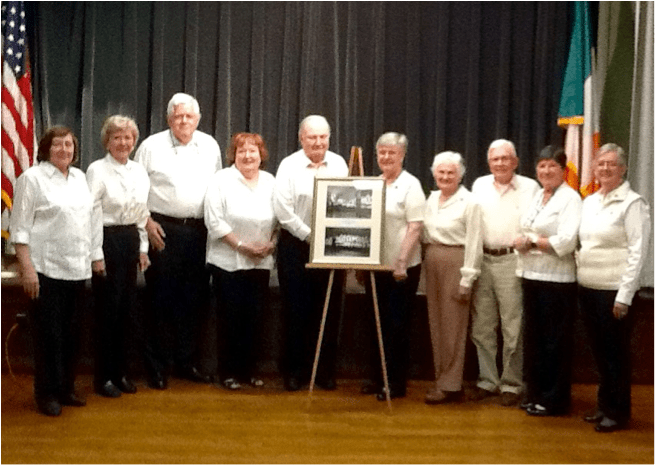 The Gaelic-American Glee Club began in 1995 with fifty enthusiastic singers. The group flourished and grew to over one hundred strong. Co-founders Art Begin and Ed O'Connor led the group through many sucessful years including concerts at The ReginaQuick Center, the Fairfield County Irish Festival, the Levitt Pavillion and a trip to Ireland with a concert at the U.S.Embassy. After twenty years, attrition and changing times brought the group to a hiatus. In 2015 the Glee Club was revived by Mary Ellen Lyons, a newly retired New Canaan Public Schools music teacher. "Commemorating the 1916 Rising needs voices to be raised in song!" Mary Ellen insisted. With the blessing and support of the GAC executive board and the urging of past Glee Club members, rehearsals began in the Fall of 2015.